My favourite lasagna variation to date! Vegetarian lasagna sounds much to be desired but I must admit this is my favourite lasagna recipe to date. 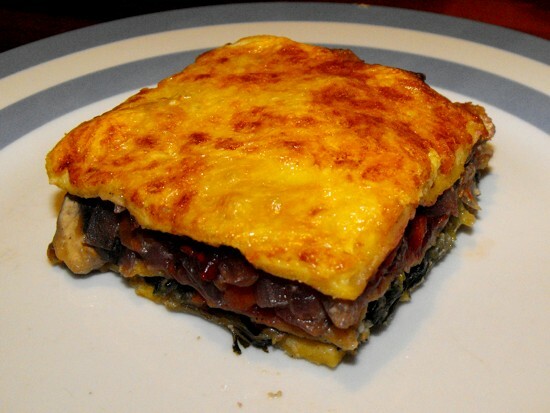 The tomato, mushroom and spinach lasagna even beats my previous favourite salmon lasagna. Its creamy texture and exciting combination of vegetables leaves the taste buds begging for more. As my mum says "yummy. Just yummy!" There is definitely no doubt about it. This is a must try recipe. 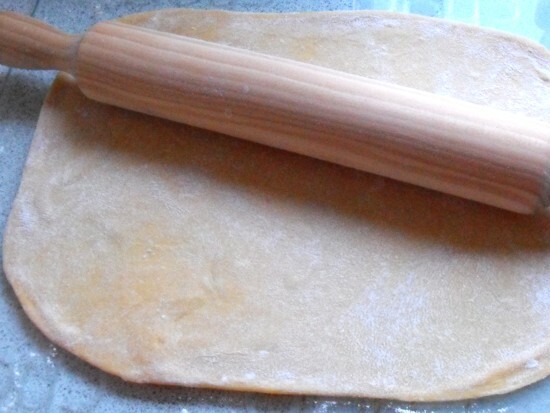 If making homemade pasta sheets prepare them beforehand. 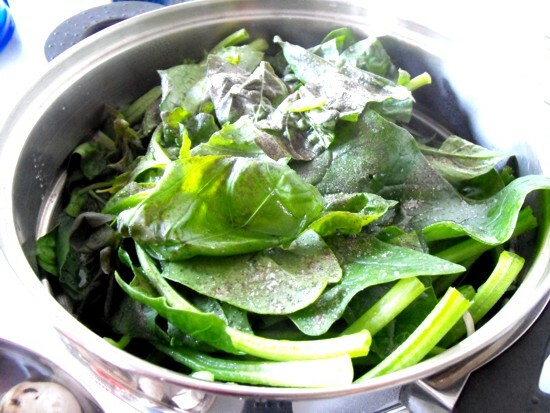 Clean spinach and steam with basil, salt and pepper (you might have to steam in two lots). 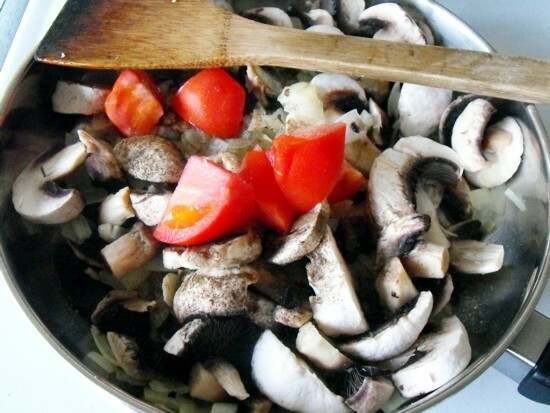 Clean the tomatoes and mushrooms and slice or dice. Fry the onions and garlic in olive oil until clear. Make sure that the onions do not go brown because they will then taste burnt. Add the mushrooms with pepper and salt. Then add the tomatoes and let the mixture simmer open for 2-5 minutes. Then turn off the heat. Lightly beat the eggs and add the sour cream. Mix well together with salt and pepper. Oil the tray and place the first layer of pasta sheets down. Layer a third of the sauce on top. Spread the spinach covered with a sprinkle of basil over top. Add the second layer of pasta sheets and another third of the sauce. Then all of the tomato mushroom mix. Add the last of the pasta sheets and the last third of the sauce. 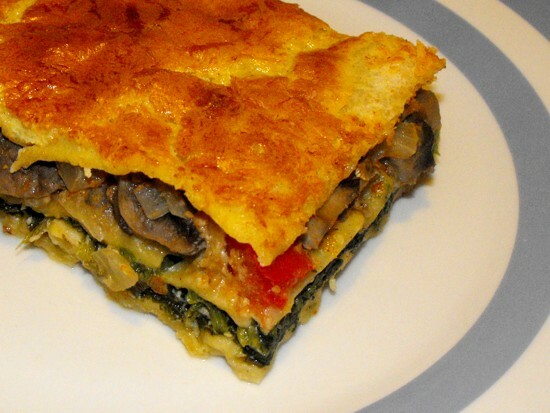 Sprinkle with Edam or Cheddar cheese on top to finish this vegetarian lasagna. Bake for 25-30 minutes at 180C°. Convert! 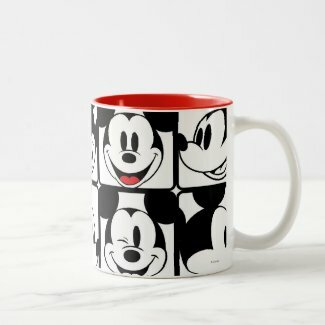 How did you like the recipe? Leave a comment using the Facebook plug-in. 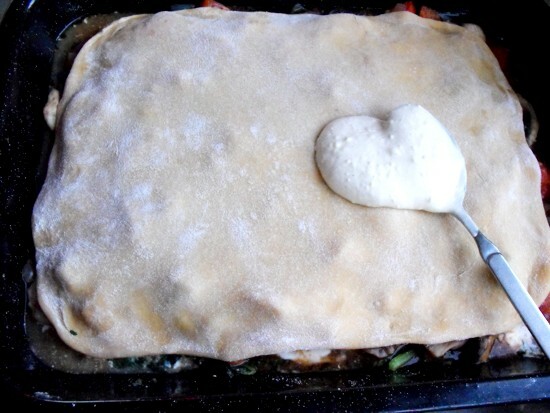 To show off your best vegetarian lasagna recipe with image build your very own page. It's easy! A variation that tastes as nice. Throughout the tamarillo season replace the tomatoes with tamarillo. Everything else stays the same. It is best to cut the tamarillos in half and spoon them out. Right beneath their outer skin these fruits have some grains which tend to find their way easier into the cooking pot when peeled. When spooned these surface and can be separated.